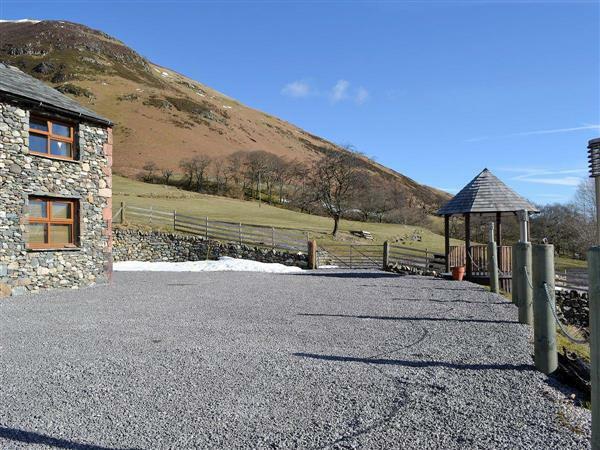 Lucys Lodge in Threlkeld, near Keswick, Cumbria sleeps 2 people. Lucy’s Lodge near Keswick is a detached timber lodge which offers the perfect ingredients for a romantic and relaxing break on the lower slopes of Blencathra, one of the most impressive fells in the Lake District National Park. Situated on a working beef and sheep farm with another holiday property (ref UK1259 [Harrisons Lodge]), this cute lodge was designed with couples in mind. It is well equipped and comes complete with its own private hot tub, so you can take a dip and indulge in some relaxation underneath the night sky. The south-facing outdoor patio area with garden furniture is a great place to soak up the sun, and offers the seclusion and privacy your romantic break deserves. The ground floor is all open plan and has a well-equipped kitchen and breakfast bar, which overlooks a cosy living room with a comfortable two-seater sofa and flat screen TV. Just off the living room is a small but high spec shower room. Upstairs, you will find a cosy bedroom with timber beams and a feature bed. If you like walking or cycling, you are surrounded by some of the most challenging fells in the area, as well as a number of less challenging walking routes suitable for people who like sightseeing without the strain. Keswick is at the northern end of Derwentwater, one of the area’s iconic lakes, and offers a great base and starting point for many an adventure. You can tick off a few of Wainwright’s 214 Lakeland Fells, including Skiddaw, Blencathra and Helvellyn within a few miles’ radius. Whatever the reason for your visit, Lucy’s Lodge offers a great base, inspiring surroundings and a touch of quirkiness to make your next Lake District getaway one to remember. The beach is 27 miles from Lucy’s Lodge near Keswick. With the shop and restaurant 1¼ miles, and the pub is ¾ mile from Lucy’s Lodge. Lucy’s Lodge can be booked with Harrison’s Lodge (ref UK1259 [Harrisons Lodge]) to sleep up to 4 people. Bedroom: With king-size bed and beams. Electric central heating, electricity, bed linen and towels included. Small patio with sitting-out area and garden furniture. Hot tub (private). Private parking for 1 car. No smoking. Holidays at Lucys Lodge run from Friday to Friday. For a better idea of where Lucys Lodge is, you can see Lucys Lodge on the map below. Lucys Lodge is in Cumbria; should you be on the lookout for a special offer, you can find all the special offers in Cumbria. It's always worth checking to see what is on offer at the moment. Do you want to holiday near Lucys Lodge (UK1260), you can see other cottages within 25 miles of Lucys Lodge; have a look to find your perfect holiday location.